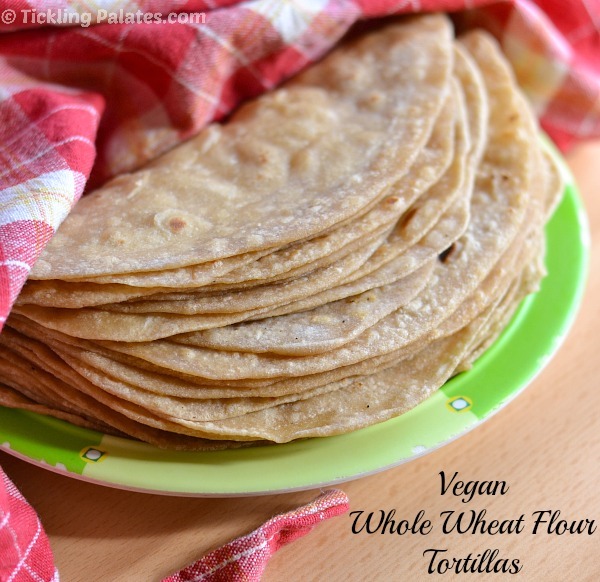 These homemade Mexican Tortillas are made with 100% Whole wheat flour and they are also Vegan. 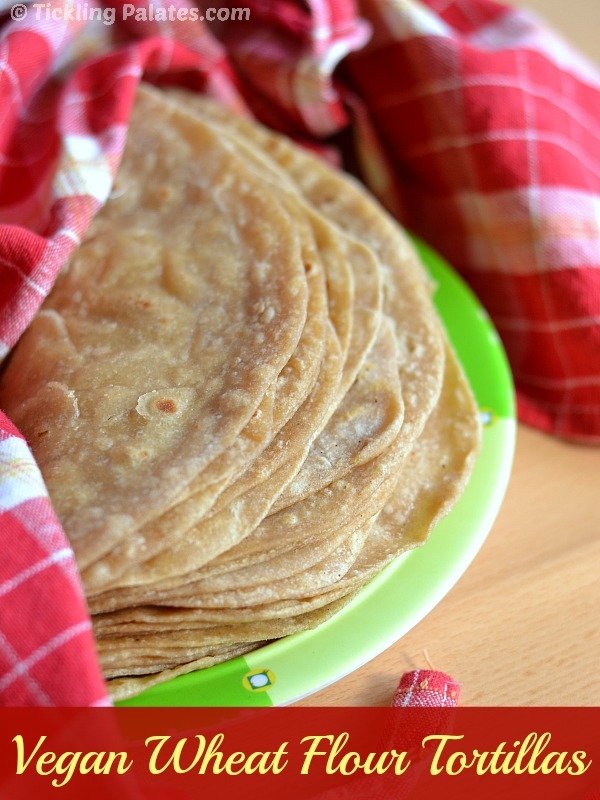 Making these at home is not only healthy but much more economical as well as you know what goes into them and when made this way, they are just full of fibre and protein. 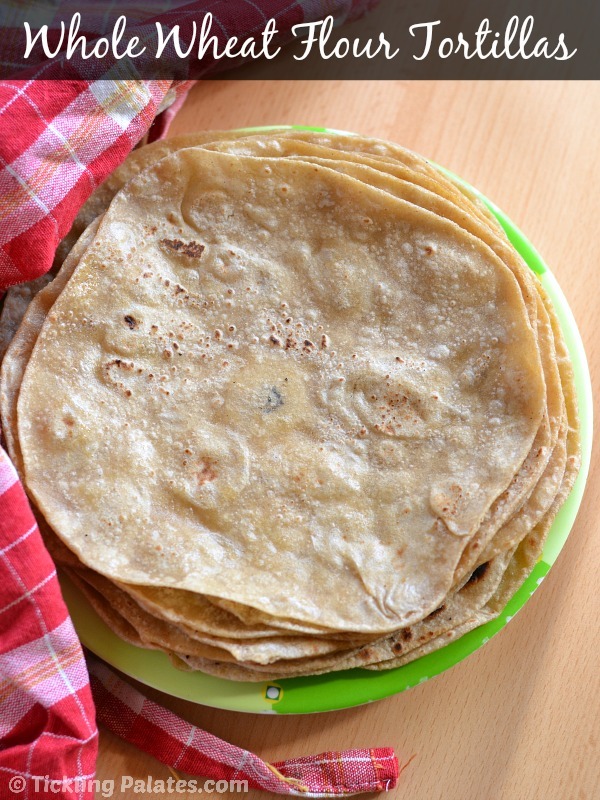 Mexican Tortillas are used as a base for making recipes like Fajitas, burritos, quesadillas, nachos and you can also make Mexican pizzas out of these. You can just stuff them with anything that you have on hand and it can be turned into a fun cooking project along with kids. 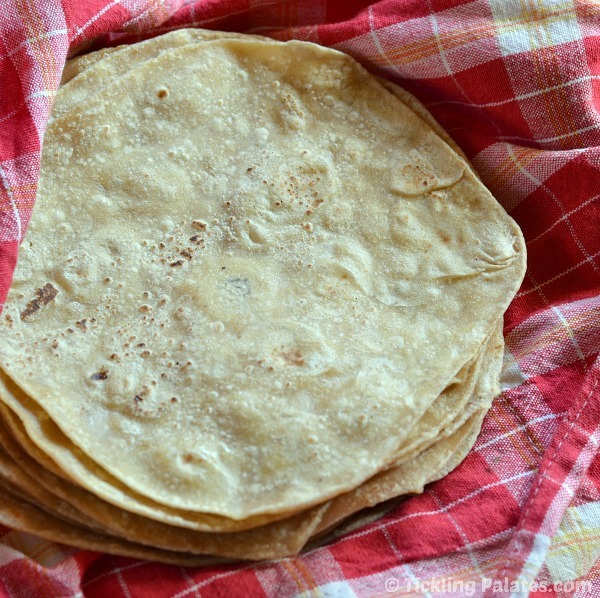 I have an electrical tortilla/chapati maker at home but very rarely use it. Though the rolling out and cooking both gets done at one single step when made in the appliance, I prefer rolling them out and cooking on the griddle. I know lots of work but still when you keep doing it on a regular basis, it stops becoming a chore. Like wise though I do have the hand mixer to knead the dough, I rarely use that as well. I prefer kneading the dough with hands, think of it as a free upper arm exercise. These can be made before hand and they also freeze well. All you have to do is thaw it before using and heat them a little. In a wide mixing bowl, mix together wheat flour and salt. Add 1 cup water first and start mixing with your hands, add more water little by little and keep mixing till comes together in a dough. Add 2 tbsp oil and work into the dough by punching and pulling. Keep the bowl closed and let it rest for 20 mins. Divide the dough equally into 20 balls. You can also grease your hands to avoid the dough from sticking to your hands. Flatten each ball slightly and keep it ready. Heat a griddle and make sure that it is moderately hot. Now place a ball on a floured board or a clean work surface and gently with a rolling pin, roll into a circle that is of 8 to 10 inch in diameter. Do not roll it too thin. Add few drops of oil on the hot griddle and grease well. Place the rolled out tortilla and cook on medium flame. You can see it puffing up and brown spots beginning to appear. This should take 30-45 seconds. Flip it to the other side and add few more drops all around and cook for 20-30 seconds. 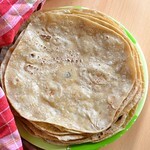 Transfer to a plate and continue with the rest of the rolled out tortillas. Keep stacking one on top of the other while transferring to the plate as it will keep them moist and soft. Eat while it is still warm. You can let these cool down to room temperature before freezing them. While dusting do not use too much flour and do not roll them out very thin as they will become crisp and hard upon cooking instead of being soft. You can let the dough rest anywhere between 20 mins to 1 hour but make sure you keep the bowl closed tightly as the dough will dry out when exposed to air around it. If you are going to eat it 1 or 2 hour after making them, then stack one on top of the other, place the stack in a clean cloth and roll along with the cloth like you roll a mat and place it in a hot case.